Problem Statement: To improve the reliability of equipment in the power engineering and industry using the diagnosing of machines conditions and predicting their performance. Diagnostics of rotating machines use vibration control methods, which allow to determine the degree of wear and consequently the technical condition of machines. When diagnosing equipment with rotational frequencies of a one Hz, inertial electromechanical transducers are used. In some designs of such transducers the electromagnetic suspension with parametric feedback allowing to control rigidity of the oscillating system is used. Parametric feedback in such devices is realized on analogue elements. The instability of the parameters of these elements and the presence of dry friction in the guides is the source of the error of the electromechanical transducer. Leakage currents in the capacitor of the feedback unit limit the low-frequency boundary of the frequency range of the transducer. Parametric feedback on analog elements does not allow the automatic adaptation of the characteristics of the transducers. Therefore, to expand the functionality and improve the accuracy of control, it is advisable to use smart electromechanical systems (SEMS). 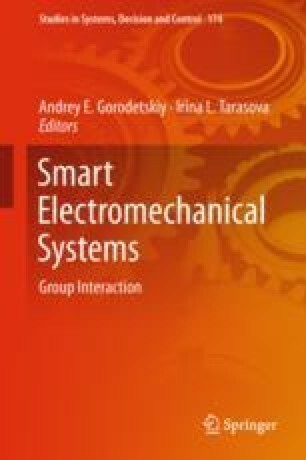 The purpose of the study: to develop a smart electromechanical system (SEMS) with electromagnetic guides and a digital unit for adaptive control of parametric feedback, which makes it possible to extend the frequency range to the low-frequency region. Using an electromagnetic suspension in the transducer will reduce the dry friction in the guides and, consequently, increase the sensitivity of the transducer. Results: the use of digital controllable parametric feedback SEMS allows to control the characteristics of the transducer depending on the measured parameters and characteristics of information signals. The use of digital devices will increase the frequency range of the transducer to a low-frequency region, since the length of storage of information in digital devices is not limited. The use of SEMS in the information-measuring system ensures the most optimal interaction between the transducers. Practical significance: the proposed intelligent electromechanical converter has improved metrological characteristics and therefore can monitor and diagnose equipment in various fields of human activity. This problem is particularly relevant in hydropower.